Want to serve up a revamped Whole30 version of one of my Chinese granny’s best recipes? 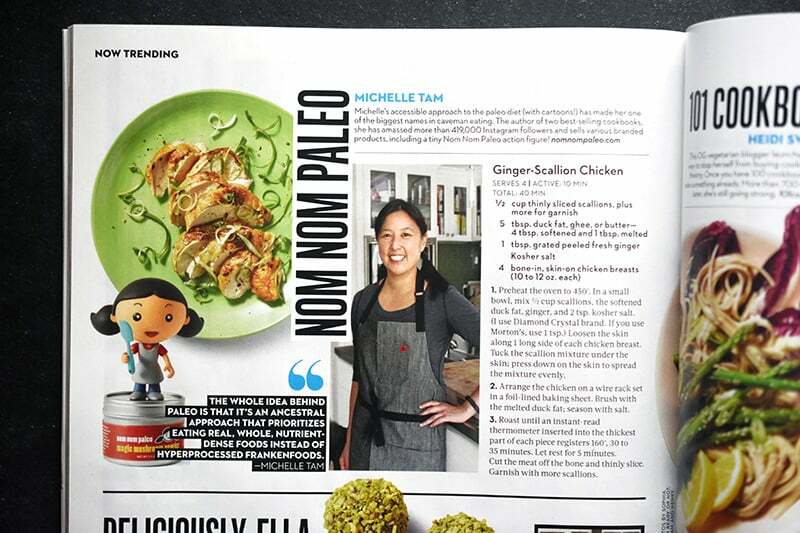 Then roll up your sleeves and make this ridiculously easy, Whole30-friendly, and super tasty Ginger-Scallion Chicken! I grew up sharing the same house with my paternal grandparents. 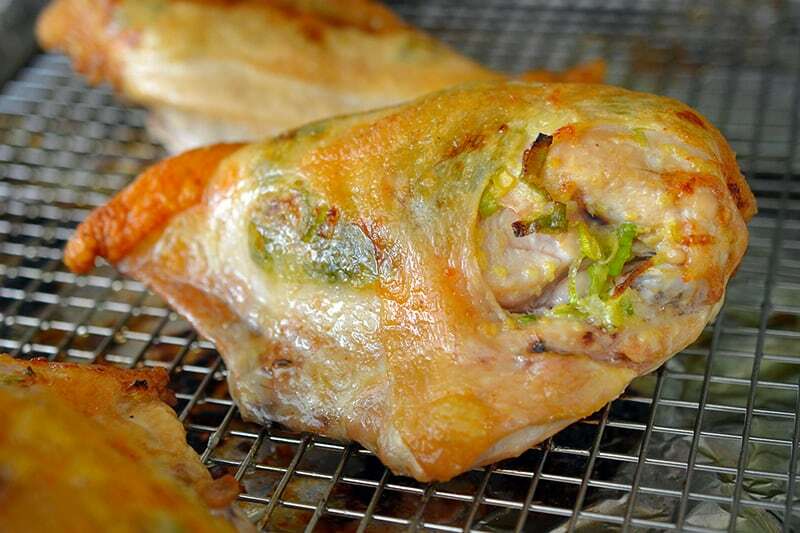 My mom normally ruled the kitchen, but on special occasions like birthdays and holidays, my grandma would take charge of preparing whole poached chicken with a ginger-scallion dipping sauce. Inspired by the traditional Cantonese flavors of my grandma’s home cooking, I came up with this umami-packed chicken breast recipe. I miss my grandma, but whenever I make Ginger-Scallion Chicken, I feel like she’s smiling down on me—and giving me a high-five for infusing the ginger-scallion sauce into the chicken breasts to keep ’em juicy and tender. Preheat the oven to 450°F with the rack in the middle position. 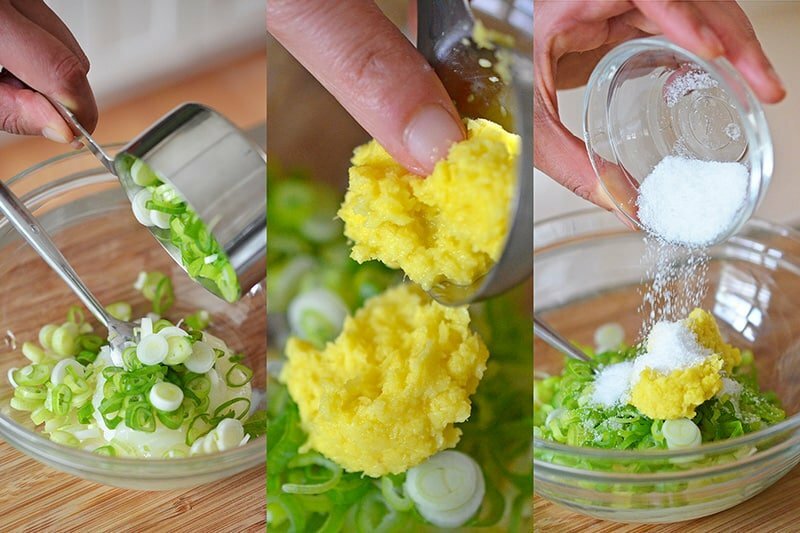 In a small bowl, add the fat, scallions, ginger, and 2 teaspoons of Diamond Crystal brand kosher salt (use half the amount if you are using a fine grain salt or Morton’s kosher salt). 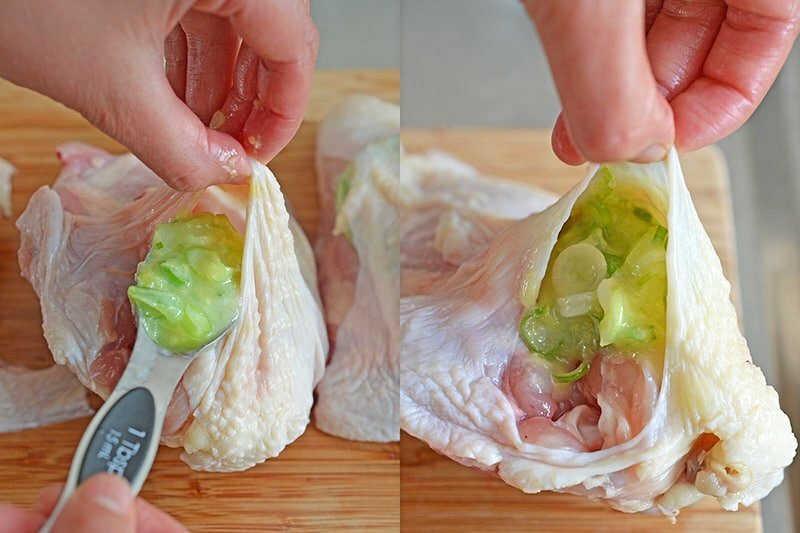 Using your fingers, carefully separate the skin of each chicken breast away from the meat to form a pocket. Add 1 tablespoon of the “pesto” under the skin of each breast. 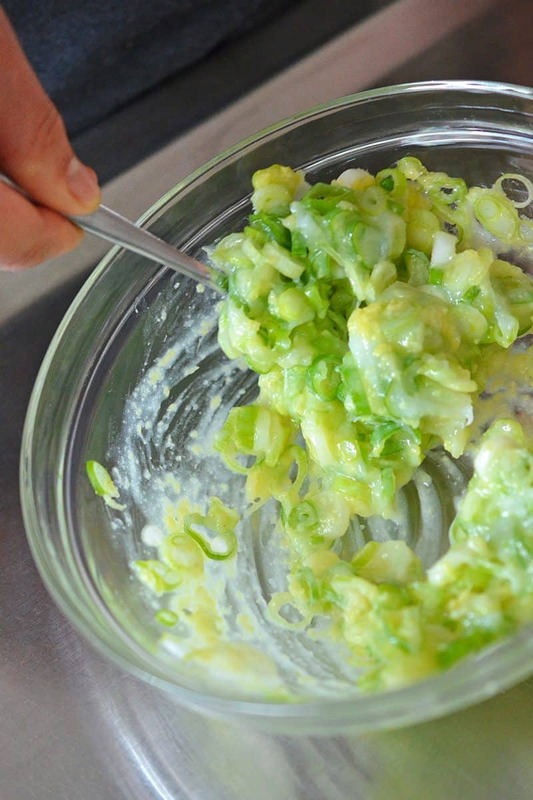 Carefully press and massage the skin to evenly distribute the ginger-scallion pesto. 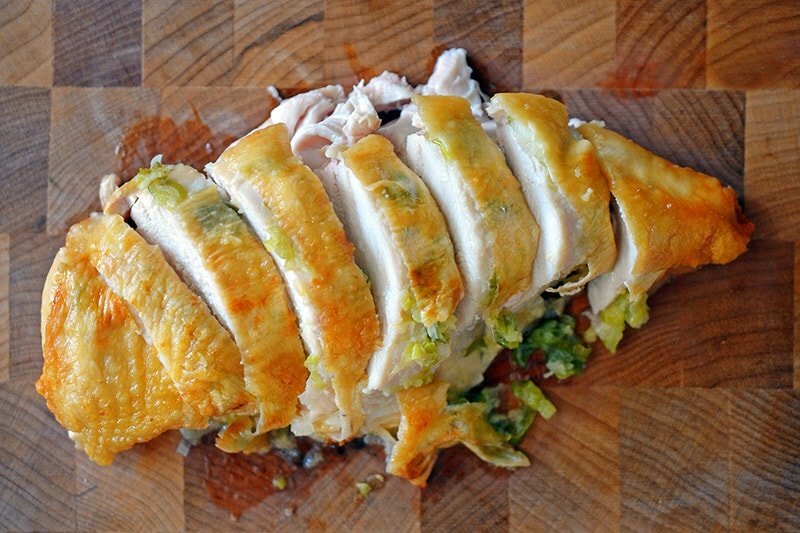 At this point, you can proceed with cooking the chicken, or you can refrigerate it for up to a day and roast it later. …and season with more salt. Oven-roast for 30 to 35 minutes or until an instant-read thermometer stuck into the thickest part of the chicken registers 150°F. Rest the chicken for 5 to 10 minutes. Debone the breasts, slice, and serve! 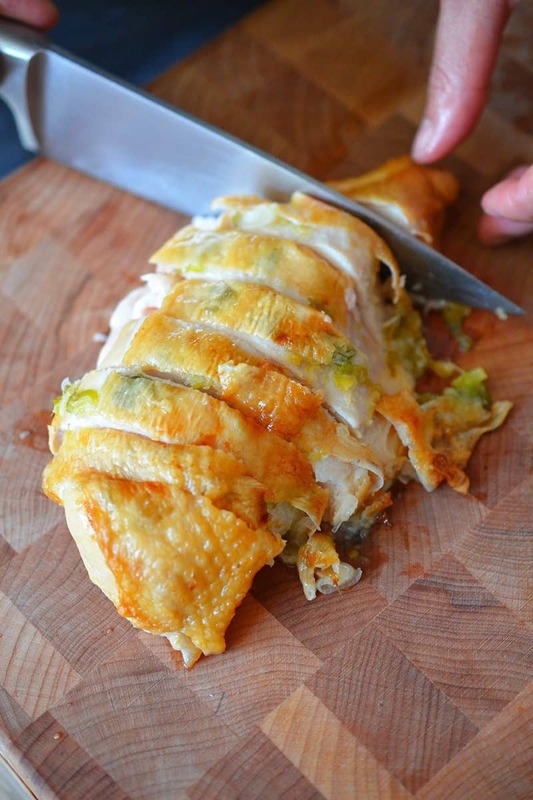 If you have leftovers, they can be kept in the fridge for up to 3 days. But that’s a big “if”! 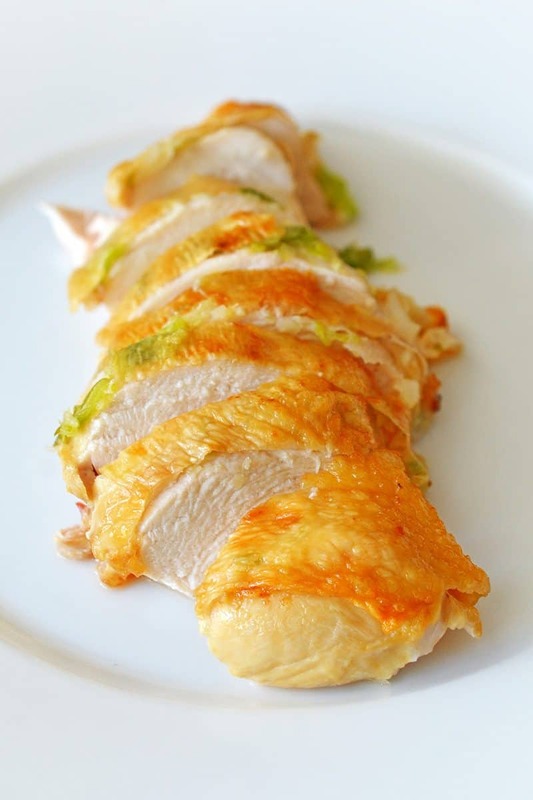 My Ginger-Scallion Chicken recipe is a simple, Whole30-friendly roasted chicken breast recipe that will knock your socks off! 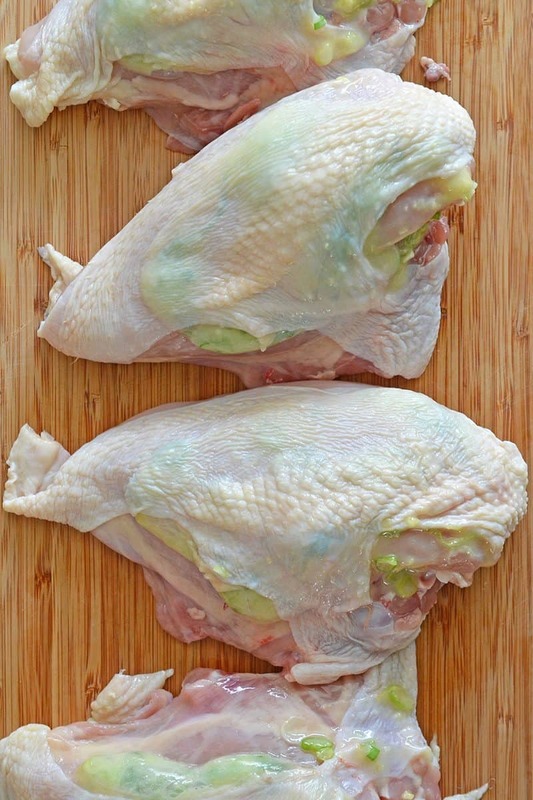 This recipe is a revamped weeknight version of my Cantonese grandma's famous poached whole chicken with ginger-scallion dipping sauce! Preheat the oven to 450°F with the rack in the middle position. In a small bowl, add the fat, scallions, ginger, and 2 teaspoons of Diamond Crystal brand kosher salt (use half the amount if you are using a fine grain salt or Morton's kosher salt). Mix well. 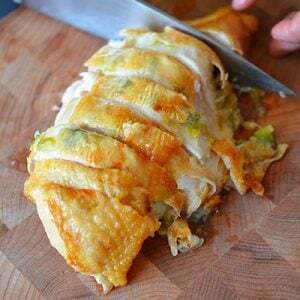 Using your fingers, carefully separate the skin of each chicken breast away from the meat to form a pocket. Add 1 tablespoon of the “pesto” under the skin of each breast. Carefully press and massage the skin to evenly distribute the pesto. At this point you can proceed with cooking the chicken, or refrigerate it for up to a day and roast it later. 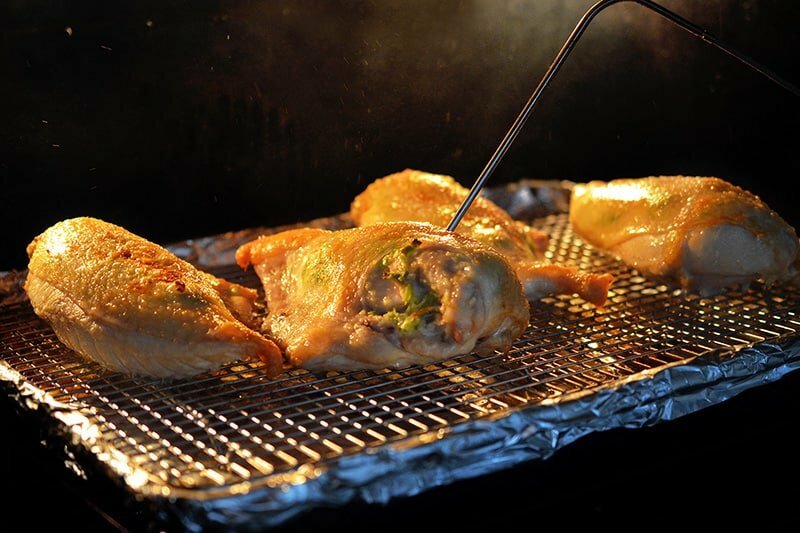 Put the chicken skin-side up on a wire rack atop a foil-lined baking sheet. You can leave it unlined if you don’t mind using extra elbow grease when you clean up later. 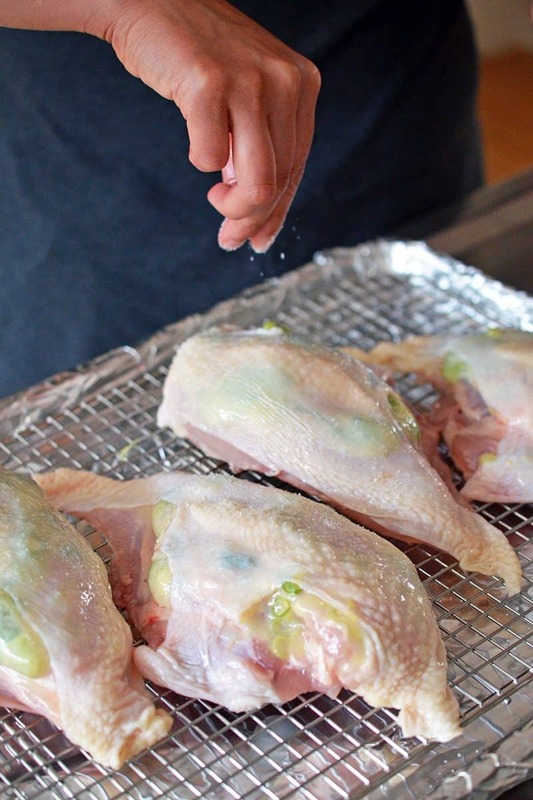 Brush the melted fat on the chicken breasts, and season with more salt. 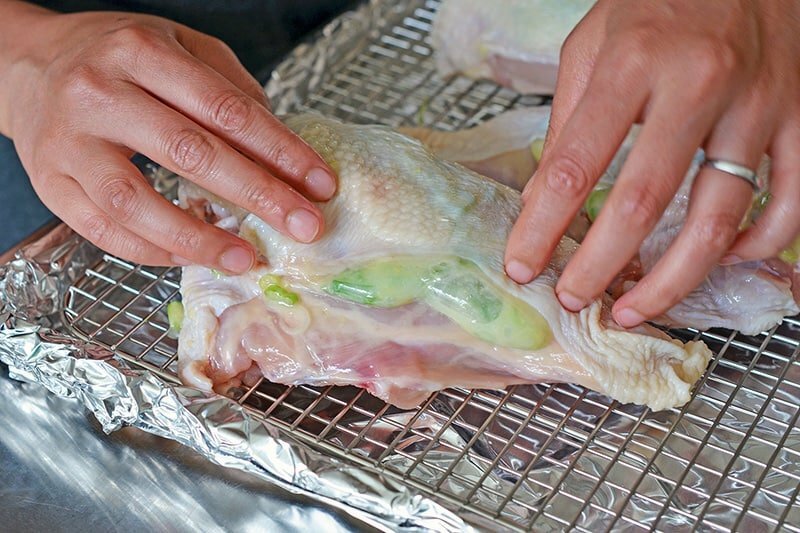 Oven-roast for 30 to 35 minutes or until an instant-read thermometer inserted into the thickest part of the chicken registers 150°F. 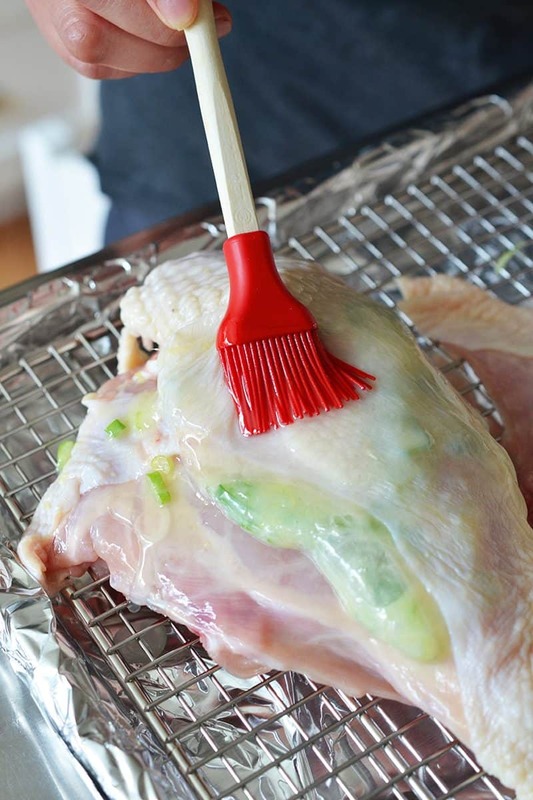 Rest the chicken for 5 to 10 minutes. Then, debone the breasts, slice, and serve! This tastes great with chicken thighs, too! You can marinate about 1 day in advance. If you go any longer, the raw ginger can make the texture of the chicken kinda mushy.